The Angels’ strange struggles against left-handed starters continued Tuesday night. Martin Perez held the Halos offense to just five hits—all singles—and no runs in six innings, striking out six. His gem was already the 10th quality start (out of 16 chances) a southpaw has tossed against Angels this season, and it lowered the lineup’s OPS vs LHPs to a paltry .667. That’s almost 50 points worse than their OPS vs RHPs, which is super weird for a team that regularly puts eight right-handed batters in the lineup. Eventually you’d expect those two numbers to flip, but for now the Angels will continue to possess one of the league’s oddest platoon splits. Carlos Perez kept his hot streak going, tallying his third multi-hit game of the last week. Mike Trout‘s double was the only extra-base hit of the day for the Angels. He’s now reached base two times or more in 11 of his last 13 games. With an 0-for-4 night, Johnny Giavotella‘s hit streak died at 12 games. This Nomar Mazara kid is stupid good, and he may well be the new face of tormenting the Angels. Mazara went 3-for-3 with a homer and a walk Tuesday, upping his season line against the club to .417/.423/.667. Ian Desmond (3 hits) also had a nice day at the plate, but his effort was superfluous given Mazara’s output. Jhoulys Chacin did a great job of limiting the damage on a day where he obviously didn’t have his best stuff. Given his role, I imagine the Angels would take six innings of three-run ball every time. Martin Perez looked as good as he ever has on Tuesday. His fastball was lively, he was able to hit his spots, and he was incredibly efficient in all but his last inning. 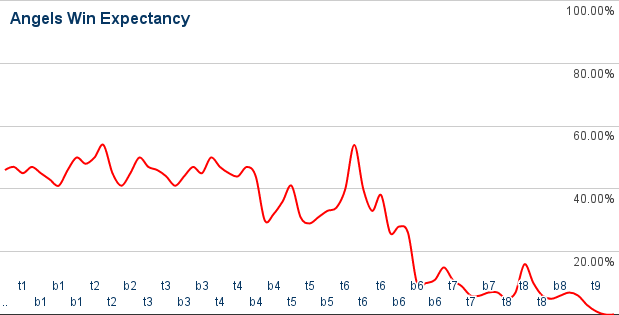 Cam Bedrosian‘s streak of appearances without an earned run ended at 14, and in just about the cheapest way possible. The Angels had Nomar Mazara caught in a rundown following a botched steal, but the defense couldn’t tag him out before the runner scored from third. The Halos made a little noise against Matt Bush in the eighth, plating their one run, but otherwise went quietly vs the Rangers bullpen. Mazara’s two-run blast in the sixth proved the difference-maker. If you’re gonna bat in the five spot, you’ve gotta produce. Sorry, Johnny.